Epiphone presents the Ltd. Ed. Allen Woody Rumblekat™ Blue Royale, one of six historic Epiphone models debuting a beautiful new Chicago Blue Pearl color finish along with distinctive “Royale” style Silver Sparkle binding. 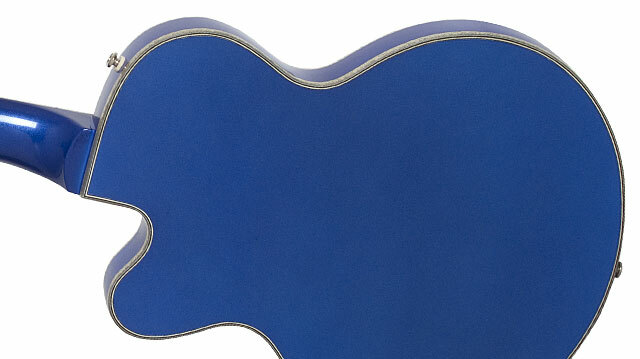 Each Blue Royale instrument features superb Epiphone pickups and electronics along with the rock solid hardware you’ve come to expect from Epiphone. The Ltd. Ed. Allen Woody Rumblekat Blue Royale is available for a limited time only at Select Epiphone Dealers. The Epiphone Allen Woody Rumblekat bass was the result of a historic collaboration with Epiphone and the late great Allen Woody, the legendary bassist for the Allman Brothers Band and Gov’t Mule. The Allen Woody Rumblekat is one of the few pro electric basses available anywhere with a 30" scale length (compared to the "standard" scale length of 34"). And now Allen Woody’s masterpiece gets the Blue Royale Treatment! The new Ltd. Ed. Allen Woody Rumblekat Blue Royale features a 2.1" thick sound chambered Mahogany body while the top of the Rumblekat is made of 5-ply flame Maple. There are no f-holes but the lightweight and sound chambered body produces clear and complex low-end tones. The body, Mahogany neck, and headstock are set off by multi-layer “Royale” style Silver Sparkle Binding complimented by a rare Chicago Blue Pearl color finish. The Silver Sparkle bound fingerboard has 20 frets, pearloid “dot” inlays, a 12” radius and Epiphone’s equally classic Clipped Dovewing 2+2 headstock which also includes Allen Woody’s distinctive signature. The Ltd. Ed. 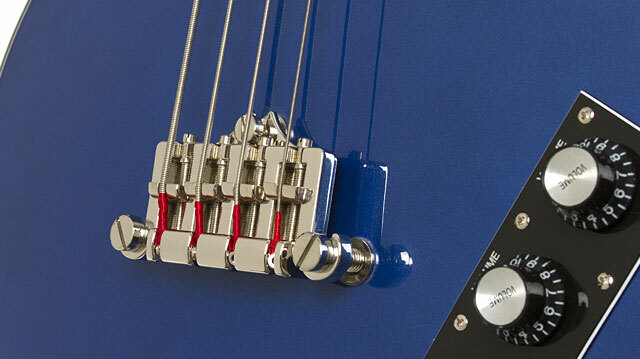 Allen Woody Rumblekat Blue Royale is powered by a NYR™ mini Bass humbucker neck pickup and a NYT™ mini-humbucker pickup mounted in the middle position. With their smaller size, narrow magnetic field, and unique design combination, the mini-humbucker produces a bright and focused output while retaining "hum-free" performance. The Rumblekat’s pickups are modeled after classic electric guitar mini-humbuckers (found in classics like the Epiphone Riviera and late 60s Les Pauls) and feature adjustable pole pieces, enamel wire, bar ceramic magnets and rounded gold plated covers set in a unique black mounting ring with height adjustment gold screws. 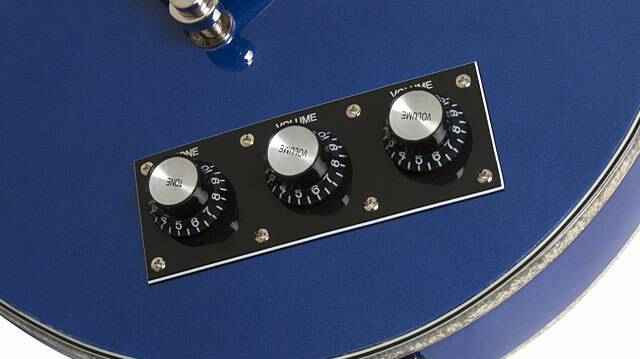 Each pickup features full-function volume knobs—Black Top Hats with metal inserts--for each pickup and a Master Tone knob using full-size 500K O potentiometers. As Bassics Magazine said in their starred review: "Using the tone knob and a little pickup bleeding, you can really get this thing to shake the walls in the lower register and have a nice open singing sound in the upper registers." The Ltd. Ed. Allen Woody Rumblekat Blue Royale has an Allen Woody-approved road tested bridge personally selected by Allen for the Rumblekat, and is height-adjustable at three points, making for a bass that can easily conform to any playing style. Along with Epiphone premium die-cast sealed-gear 17:1 machine heads, a “tortoise shell style control plate, Epiphone’s heavy duty ¼” all-metal output jack, and solid nickel hardware, the Ltd. Ed. Allen Woody Rumblekat Blue Royale is a beautiful instrument that comes with the security of knowing you can count on years of uninterrupted playing on stage and in the studio.